On Feb. 2, students in Honors 2488 “The Critical Eye” recorded a demo of a song they wrote under the guidance of L. Russell Brown, writer of “Tie a Yellow Ribbon ‘Round the Ole Oak Tree,” who served as the artist in residence for the course. Taught by Professor of Entertainment and Music Business Dr. Larry Wacholtz and Associate Provost Dr. Beverly Schneller, the class offers an examination of important and influential works from the fields of music, art, literature and drama, and explores the criteria by which those works have acquired their standing, with an emphasis on essential works from the student’s field of study. The Critical Eye is the first course Honors students take in the Artist Studio track. The purpose of the course is to explore ideas of creativity, experience creativity and develop the ability to critique and evaluate creative products. The course is designed to engage students in a range of creative practices from collaborative songwriting to painting and glassblowing to writing short stories and performing in an original one-act play. 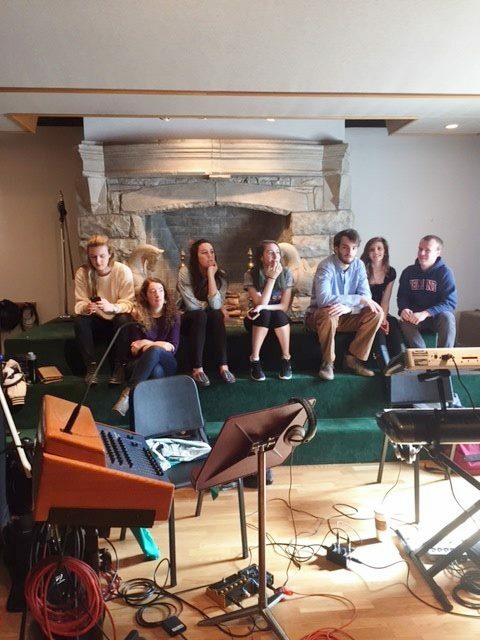 The students recorded the demo, found below, in Belmont’s Ocean Way Studio C with fellow Belmont students serving as the session musicians.